When Qualcomm announced a pair of Windows 8-compatible ARM processors yesterday, we knew Texas Instruments wouldn't be far behind. Sure enough, the company has just announced a new addition to its OMAP 4 family of ARM SoCs, with the 1.8GHz OMAP4470. TI's new chip is powered by a pair of 1.0GHz ARM Cortex-A9 MPCore engines, as well as two, 266MHz ARM Cortex-M3 cores that handle multimedia duties. According to the company, this multi-core structure will enable faster web browsing and more frugal power usage, while putting the OMAP4470 in square competition with quad-core chips like NVIDIA's Kal-El and Intel's latest Sandy Bridge line. The SoC was designed for tablets, netbooks and smartphones running Android, Linux, or the next version of Windows, and can support a max QXGA resolution of 2048 x 1536, and up to three HD displays. There's also a single-core PowerVR SGX544 GPU capable of running Direct X 9, OpenGL ES 2.0, OpenVG 1.1, and OpenCL 1.1. The OMAP4470 is expected to hit the OEM and OED markets in the first half of 2012, but you can find more information in the specs sheet and press release, after the break. TAIPEI, Taiwan, June 2, 2011 /PRNewswire/ -- COMPUTEX -- Building on the OMAP™ 4 platform family's technological achievements , Texas Instruments Incorporated (TI) (NYSE: TXN) introduced today the power-efficient OMAP4470 applications processor, designed to deliver the perfect balance between processing power, graphics, display subsystem functionality and multilayered user interface (UI) composition. 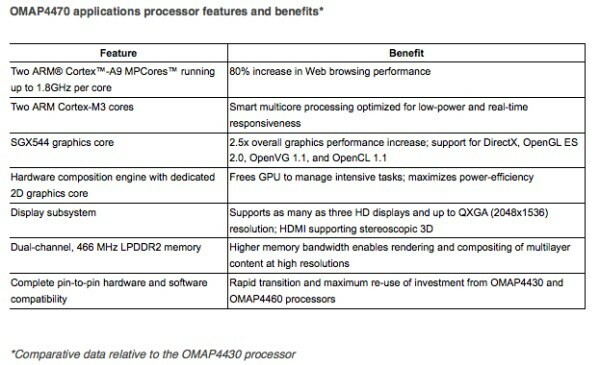 The multicore OMAP4470 processor surpasses current market solutions with clock speeds up to 1.8 GHz, an 80 percent increase in Web browsing performance, increased memory bandwidth, a 2.5x boost in graphics functionality-via the POWERVR™ SGX544 core from Imagination Technologies-and a unique hardware composition engine. Mobile computing and gaming applications running on operating systems such as Android, Linux and the next version of Microsoft Windows will benefit from the OMAP4470 processor's enhanced capabilities. Customers designing ultrathin laptops, tablets or smartphones around previously released OMAP 4 processors gain the added benefit of pin-to-pin hardware and software compatibility for maximum re-use and faster time-to-market. "Superior mobile computing relies on a user experience that dwarfs all others. Fast and crisp Web browsing, HD and liquid UIs, support for the latest applications-these are the elements consumers judge and buy their devices on. The OMAP4470 processor delivers the maximum experience possible with an unmatched, power-efficient architecture," said Remi El-Ouazzane, vice president, OMAP platform business unit, TI. Courtesy of its advanced graphics architecture, OMAP4470 enables customers to leverage tomorrow's leading-edge display technology by supporting resolution up to QXGA (2048x1536). The new applications processor drives still more unparalleled HD UIs with simultaneous support for up to three HD screens and up to 2x more layered imaging and video composition than competitive solutions-a capability required by the sophisticated UIs of next generation operating systems. This feature is enabled by the combination of a hardware composition engine with a dedicated 2D graphics core, a highly sophisticated display subsystem, and dual-channel LPDDR2 memory enabling up to 7.5 GB/s of throughput to composite the graphics and/or video data output. This frees the GPU to perform graphics-intensive tasks such as gaming or widget creation while the compositing process is assigned to more power-efficient hardware subsystems. Powerful enough for desktop applications yet highly power-efficient for mobile applications, Imagination Technologies' POWERVR SGX544 GPU complements the OMAP 4 platform's promise of high performance, low power. The OMAP4470 processor is the first OMAP offering to leverage the POWERVR SGX544. Combining the SGX544's features with the sophisticated OMAP architecture enables TI customers to deliver a new set of applications to end-users, including DirectX-driven games and videos. "Graphics processing is now at the very heart of the mobile computing experience, providing the gateway to an enriched experience of user interface, gaming, location services, web and media," said Hossein Yassaie, CEO, Imagination Technologies. "Combining the OMAP 4 platform's low-power, high-performance architecture with the extensive acceleration capabilities and API support of Imagination's POWERVR SGX544 will enable experiences that will really make people sit up and take notice."